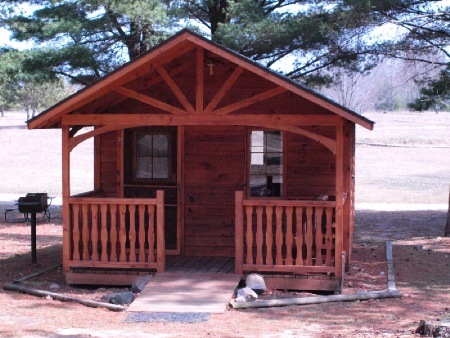 ENJOY OUR COMFORTABLE NON-SMOKING RUSTIC CABIN ! SLEEPS FOUR. 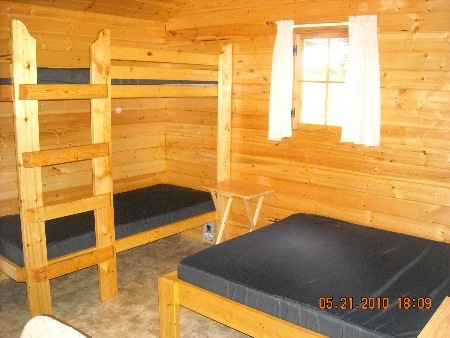 INCLUDES AIR CONDITIONING, HEAT, A FULL-SIZED BED, BUNK BED, A DRESSER, TABLE AND CHAIRS AND ALSO A SMALL REFRIGERATOR. IT IS WHEEL-CHAIR ACCESSIBLE. THERE IS LIMITED ELECTRIC INSIDE THE CABIN. THE CABIN HAS A SIX FOOT PORCH. OUTSIDE IS A PICNIC TABLE, A FIRE RING AND A PERMANENT CHARCOAL GRILL. ALL COOKING IS TO BE DONE OUTSIDE THE CABIN. THERE IS RUNNING WATER NEAR-BY. NO FAMILY PETS ARE ALLOWED INSIDE THE CABIN. YOU WILL NEED TO BRING YOUR OWN BEDDING. PLEASE DO NOT BRING IN FIREWOOD. WOOD IS AVAILABLE AT THE STORE. NO TENTS ALLOWED ON CABIN SITE. 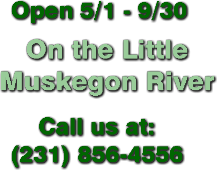 THIS UNIT RENTS AT $70 PER NIGHT WITH A TWO NIGHT MINIMUM FOR WEEKENDS AND A THREE NIGHT MINIMUM FOR HOLIDAYS.